This is the right subtitle for this video, because the ending of the clip is hilarious, but I won’t spoiler you any further. I followed Jana in the tram, from the beginning when I met her on the street to the grand final. Jana was wearing old worn flats and trashed tan colored nylon socks. In combination with her blue jeans and a white top this looked just awesome. There was a great dangling show and a good portion of shoeplay. 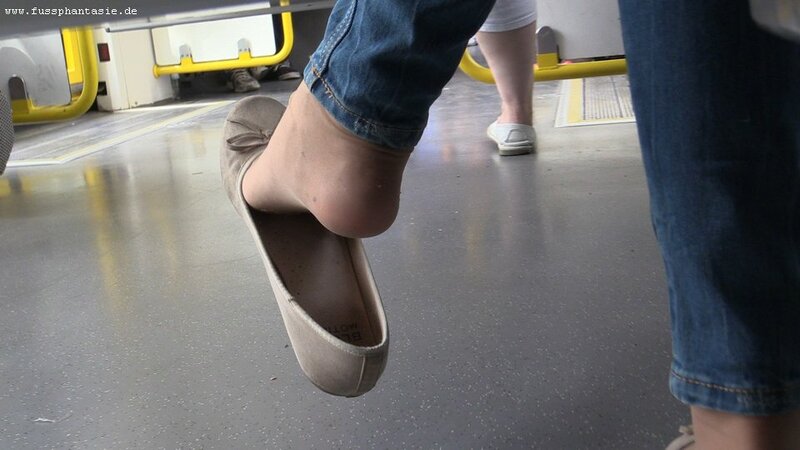 An awesome moment was, when Jana took off her flats and put her nyloned feet onto the seat, in direct sight to my eyes. A technical side note: We did the whole scene in the tram in one take, there is no cut. It becomes noticable that Jana is very experienced with cameras and that I do candids for a long time now. This was a truely mastershot!